It is strange as I go back and edit the pictures from my recent trip to look at crackling fire places, fall colors and warm and cozy living spaces while I sit here sweating in the ever green tropics. It is hard to imagine that I was going around in a down vest just over a week ago and that Melinda had given me one of her own handknit hats to keep me warm while visiting friends in the east for Thanksgiving. And, a yurt in California, with sheep skins, plush pillows, a down comforter, soft lighting and heating was my exotic bedroom for two nights. My first time in a yurt was back in 2010. I went to the Maryland Sheep and Wool Festival and the temperature was unexpectedly high….well into the 90s. After a hectic morning visiting the vendors and waiting in line for cold drinks, I wilted and took refuge in a yurt that had been erected. In more ways than one, it really was the coolest place to be. I attached my backstrap loom to the wooden lattice walls and sat on top of the sheep skins to weave. A refreshing stream of air was drawn within from the opening in the roof. I wished I could have stretched out and napped but people kept entering thinking that I was the ”keeper of the yurt” and asking me questions about it. I imagined spending a night under that roof opening and gazing at the stars above the plains of Mongolia.. I visited a weaving friend, Sara Lamb, on one of my trips and marveled at her exotic yurt fiber studio nestled in the woods…. And this was my yurt bedroom at Susie and Rex’s place for a couple of nights on my latest trip. What fun! In his living room, Rex had erected a pole for his backstrap weaving so he could sit among the collection of exotic rugs and textiles and create some of his own. The pole is seated in a plank which is weighed down by piles of books and furniture and allows him to experiment with having his warp extended at different angles. Perhaps one day he will create a band to encircle the mini yurt he built in the backyard in which I got to spend those luxurious nights. Yurt band woven structures became a part of my weaving experiments back in 2009 when my friend Lisa showed me a band that she had purchased. Even earlier than that, in 2007, I had made my first visit to the Textile Museum in D.C where I was inspired by its exhibit of tent bands of Central Asia. I spent some time weaving with both Susie and Rex. Rex showed me a small experimental bench he had built to make sitting at a backstrap loom more comfortable. I tried it out and I have to say that it was quite amazing. Here’s Gwen showing us how it works…. It was really comfortable sitting in this position…a position which I simply would not be able to tolerate for long without the support of this little bench. This position, sitting on the back of the calves, is how my Guatemalan weaving teachers sit with their backstrap warps angled rather steeply upward. Put a little cushioning on the seat of the bench and it would be perfect! What a clever simple device. Rex wanted to give it to me to take back to Bolivia. If only I had had room! All this yurt talk takes me now to what I have been weaving this week. In the last blog post, I showed you the silk warp that Sara had given me. There it is above…the gorgeous reds, orange, fuchsia, copper and purple. It is reeled silk that she dyed and warped and passed on to me to enjoy. I am hoping that along the way, some of Sara’s color sense rubs off on me. And now, off the loom and washed and pressed undergoing that wonderful transformation that I have told you about before. It’s quite likely that you won’t be able to see the difference but, believe me, you can feel it…. I made a little yurt-ish shaped pouch. We can even imagine, if we like, that the strip of pebble weave is the band encircling the yurt. I had enough fabric to be able to cut a circle which forms the base of the bag and then sew the remaining cloth to it…a rather big challenge to my hand-sewing skills. It isn’t finished. I hope to add some exotic tassels somehow with the copper-color silk that Sara gave me and possibly edge the seam where the body connects to the base with a tubular band. And, of course, a strap is needed too. So, now I have plans….I have my 60/2 silk and I want to weave a ribbon to edge the neckline of a black tunic top that I recently bought. I have all the colors of the warp that Sara gave me, except the fuchsia. I want to edge the neckline of the tunic with a band of those colors and use the little yurty pouch when I wear it. Urgh…I can hardly believe what I am saying…fashion plans! There will be much sampling and I just hope that I don’t destroy the tunic top in the process. My main concern is whether I have the ability to neatly sew on the ribbon. So, there are the tubes of 60/2 silk that I plan to use with a line-up of possible replacements for the fuchsia that I am lacking. And, that’s the backstrap I wove with the Good Earth cotton/linen yarn. It is not as plush as the Plymouth cotton backstraps that I have made before but I really like the way this yarn feels. It is certainly a good sturdy backstrap. The fuchsia yarn labeled Luxor that you can see was a gift from my friend Wendy in Australia. You may remember Wendy Garrity from previous blog posts about the time we spent together here in Santa Cruz and later in Santa Fe and the weaving she learned to do in Bhutan. She sent me a care package that showed up two days ago with all sorts of Aussie biscuits and sweets as well as this yarn. I wasn’t expecting it at all! She had been using the yarn in the Key Fob Weave-along that we ran earlier this year and I was interested in trying it and writing about it for backstrap weavers in Australia. The Luxor 100% cotton, is made by Fibra Natura, the same brand as the blue cotton/linen. These are two bags that form part of Lori’s collection of Huichol textiles. They have been woven using a balanced double-weave structure and have interesting edgings. I took lots of pictures of those edgings to study more closely now that I am at home. It is so exciting to discover decorative edgings on these pieces from Mexico. If anyone knows the origin of this scarf, Christine and I would love to know. Christine found this in a Goodwill store and I love it. The main pattern is beautifully fine and simple and the whole thing is set-off by the fascinating more complex patterns at the ends. The little figures at the ends are identical on both faces. It seems that some of the warp ends themselves were used to wrap others and create the motifs. I would like to figure out the technique and this is something else that will have me peering at my photos. Nicole made me so happy when she showed me the tapestry piece she had woven as a cover for her iPad. She edged it with a plain-weave tubular band that she had learned using the tutorial on my blog. 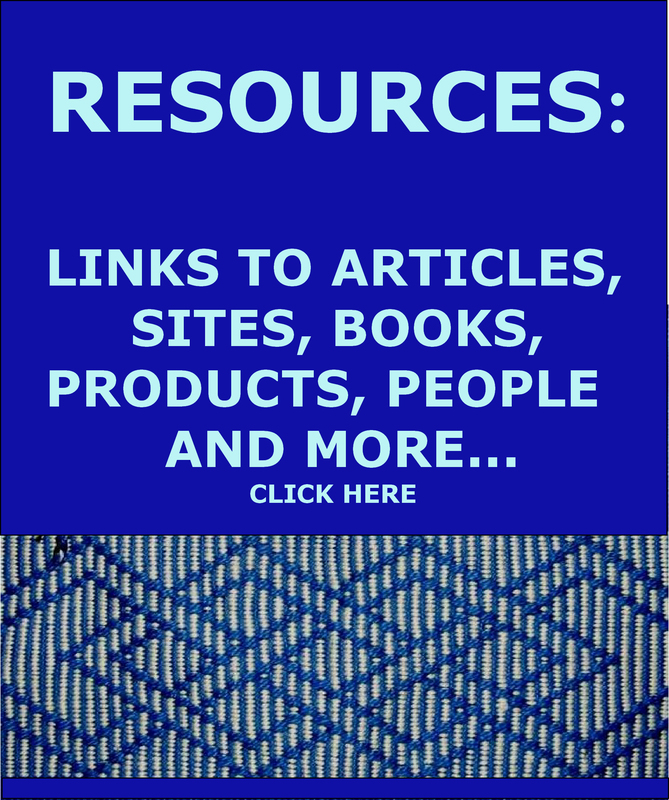 It is funny that other weaving friends, Sara and Diane, had just been suggesting the possibility of using the tubular bands as edgings for not only warp-faced weaves, but also for weft-faced pieces and even knotted pile. And then, along comes Nicole to show how well it works. Here’s Leslie’s backstrap showing us how nice the variegated Plymouth yarn can look. She had just started braiding the ends. The pale solid stripe that she added in the center really sets off the variegated stripes. I got to see pieces, now off the loom, that Jean and Jane had been working on last time I met up with them. Jean’s black piece with its pattern in supplementary weft is her new backstrap. 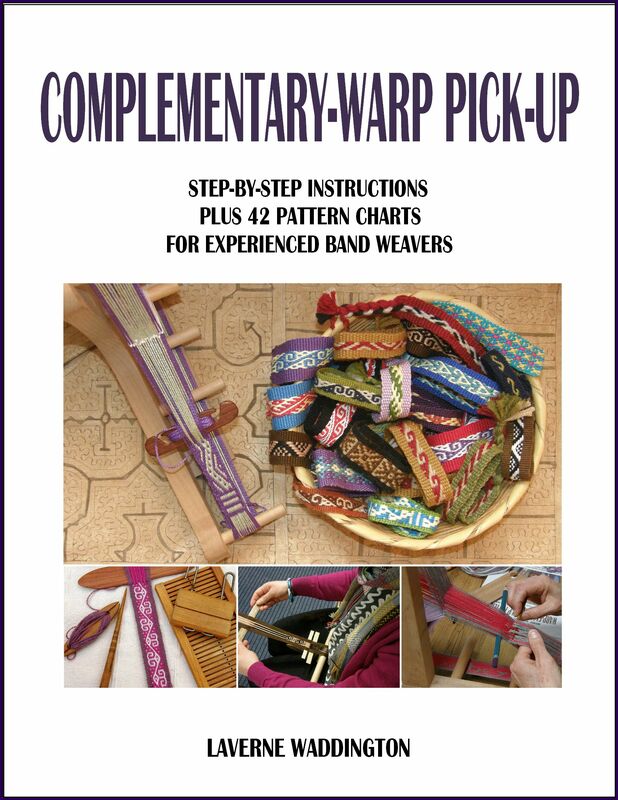 She adapted a warp pattern from my second book to the supplementary-weft structure…so clever. I am pretty sure that Jane intends sewing her fabulous complementary-warp pick-up piece into a bag which she will edge and decorate. Liz and Caroline showed me what they have been working on since we last met and wove together. Caroline made her own backstrap and is currently weaving the band with the bird figures. I love Liz’s band in the middle with the variegated thread. I keep saying I want to try out some of those variegated yarns and have not managed to do so yet. 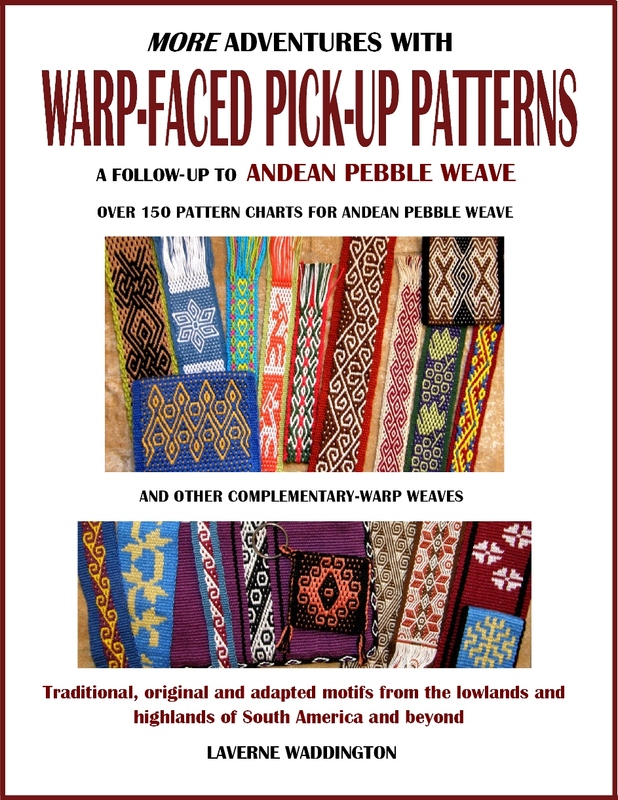 And, Deanna made me smile a lot when she went on to design her own Andean Pebble Weave figure after my stay with her. These are experiments for a hatband for her Mustang-driving husband. She was inspired by some tablet-woven horses that she had seen. 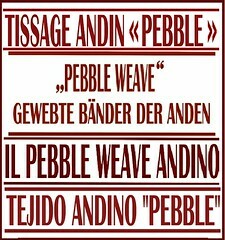 As she discovered, designing for Andean Pebble Weave is just like a connect-the-dots exercise. And here is what Julia wove, after we parted, using Andean pebble Weave patterns from my second book….we all love that red and black! Julia’s work is gorgeous and always so beautifully finished. She is great inspiration for everyone in the Ravelry group. I was tickled to see a pattern I had charted for the second book but never woven myself…the one on the right. I just read on Facebook that Unicorn Books closed last week. Sad. In 1995, my new weaving friend in Colorado, Gladys, gave me their catalog to take back to Chile with me. The catalog was like a newspaper and oh, how I would love looking over the pages and pages of fiber arts books. I ordered Double Woven Treasures of old Peru from that catalog and waited impatiently for it to be shipped to the southernmost tip of Chile where I was living. It was that book that had me throwing on the backpack and heading to Peru to learn to weave in 1996. And, just to show that my recent trip wasn’t all about crackling fires and chilly nights…southern California put on some spectacular weather and Deanna, Gay and I spent a gorgeous afternoon having lunch at the ocean. You can see the exotic woven band…a balanced double weave pick-up… on the Panama hat that Gay lent me for the strong sun. It is one of many textiles that Gay and her husband collected in their travels. 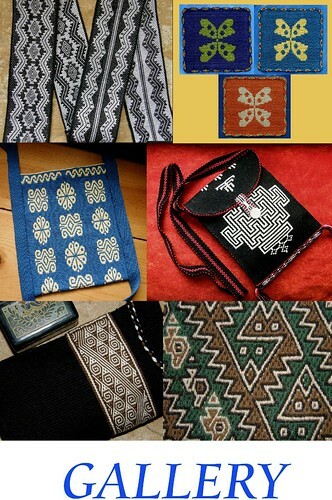 You may remember when last I visited her I was so excited to buy a Huichol belt from her that had designs I had once chosen to weave in a piece of my own, also in balanced double-weave pick-up. I took lots of pictures of it and then gave it a nice home in my friend Janet’s place. I will leave you for now with the setting sun on that perfect day down by the sea and get back to decorating my little yurt bag…. Hi Kate. Thank you so much for the gift of all that Guatemalan cotton. I am waiting for it to tell me how it wants to be used! Your little silk yurt bag is absolutely gorgeous! What a perfect idea, the softness of the fabric allowing you to gather the edge that way. It is clear in your photos that the washing process does change the silk fabric. Such amazing colors. Beautiful, beautiful! You will look fabulous in your new outfit and handbag. The yurt bag is stunning!!!!!!!!!!!!!!!!!!!!!!!!! Hi Cheryl! Glad you like the bag. I can’t wait to embellish it. I love the bench! It is very similar to a design I have seen for a meditation bench. Is he making these for sale? Not that I know of, Terry, but I will mention to him that there is interest.